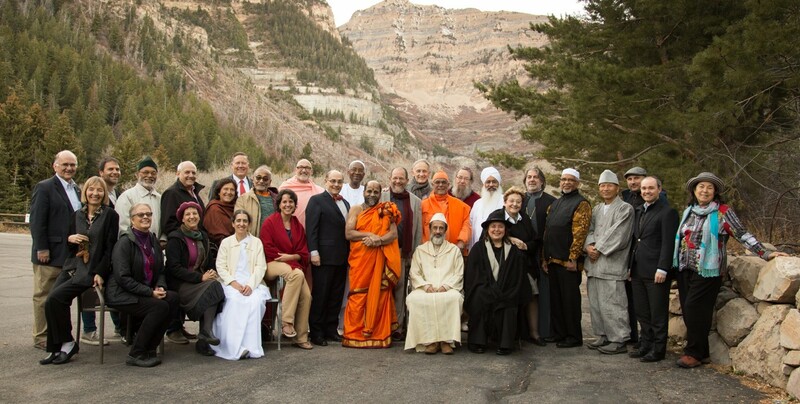 Members of the Elijah Board of World Religious Leaders not only take part in activities organized by Elijah. They also bring Elijah’s voice to their communities and to events organized within their communities. The most recent expression of Elijah reaching out into the community was an invitation by Shrivatsa Goswami for Elijah to hold an interfaith study session as part of the recently held Kumbh Mela. The Mela is a gathering of faithful that takes place once in four years, with the great gathering (Kumbh) taking place once in twelve years. This gathering takes place at a sacred confluence of rivers – two visible, one invisible, based on an ancient Hindu tradition of the former existence of the Saraswati River. The two visible rivers are the Ganges and the Yamuna, and they come together in Allahabad. The place of confluence becomes for a period of over a month a camping site for about 2 million (!) faithful. These camp out for what is a spiritual retreat around the holy confluence. Formally, the core activity is taking a dip in the confluence, said to be an act of purification and expiation of sins. Some dip daily, some on special days identified within the month long period. But in fact, dipping in the holy waters turns out to be secondary to the main activity. Or rather: of the 20 million who come to dip in the river, about 2 million do a lot more than come for a day’s dip. These faithful gather for a spiritual retreat within their community setting. 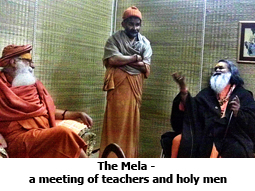 Teaching, praying, meditation, spending time with one’s Guru, encountering other teachers and faithful, a gathering of holy men – all these are the stuff of what makes the Mela tick. The Mela is in fact a community of communities, a huge 56 square kilometer tent city, broken down into small individual encampments, organized by specific religious groups and communities. Hinduism’s wealth and diversity is evident in the range of groups, teachers, customs and practices that can be seen at the Mela. Shrivatsa’s invitation to teach at the Mela was an invitation to share with his own community; there is no central stage or central location that might conceivably address “all” participants in the Mela. But the invitation reached out to other communities, so that when we went clothes shopping the day before in town, the woman buying a sari besides us knew about the event, and consequently attended it. We thus participated in a relatively intimate event, with broader community outreach, thanks to Shrivatsa’s initiative and hospitality. All that I had seen previously from the Mela featured the colorful life of sadhus, the wondering ascetics, with painted faces and a variety of accoutrements, that make for great photo opportunities. If there is one thing that struck me it was how deeply communal, and even familial, the Mela is. To enter the Kumbh Mela is to enter the life of a community of faith, gathered around a spiritual teacher. The setting we were in, within Shrivatsa’s camp, was typical of the entire gathering and someone who has no relationship with a community will likely not find his place at the Mela. This is why there were practically no tourists at the Mela. It is an expression of the interior life of a community. One new friend, who I believe will be joining the Elijah Board of World Religious Leaders, is Karshni Swami Gurusharanananda. His Ashram complex shows one the life of community at the Mela in all its fullness. 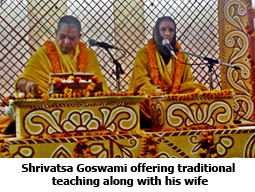 Daily teachings, musical offerings, dramatic renderings of the life of Krishna, prayer service, time with the Guru and hosting of hundreds of sadhus – all these provide the daily rhythm for several thousand faithful who live in a nearby camp. The Mela is a rich artistic fare, an occasion for multidimensional teaching, with music and drama at the forefront, and a time of being together away from life’s daily cares, devoted to the spiritual life. In all this, the confluence of rivers is the backdrop, not the focus. But sometimes one must see things through the eyes of one person. 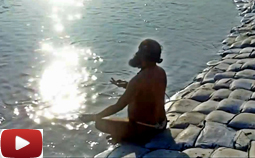 The moment at which the Mela, and especially the practice of taking a dip at the confluence, came alive for me, was an encounter with a Swami from the Saiva tradition, whose name I do not know. We chanced upon him as we visited the site of the confluence for the first time. Among dozens of ordinary pious men and women taking a dip, was this one sadhu, holy man, whose devotions stood out for their theatricality, intensity and devotion. The ritual of preparation for going into the water, the dip, the meditation that followed and an intense talk with the river followed by a chant of devotion was mesmerizing and probably worth the trip in and of itself. When I recently learned that the phone company had taken my Blackberry’s memory card in the process of repairing the device and lost it, I was heartbroken more than anything else for the loss of this most powerful display of devotion. A small taste of this devotion can be seen on the clip we uploaded to YouTube (click on picture to view video). The most inspiring moments remain a memory I unfortunately can no longer share with readers of wisdom. Stretching between the testimony of individual piety and communal edification, the Kumbh Mela shows the power of faith, writ large, in a way that only India can produce. It is a reminder to what matters most, and an occasion to recall how deeply faith matters to millions and millions of Hindus. In this we find our deepest commonality across religions. We had planned on all religions being present at part of the Elijah delegation to the Kumbh Mela. As it turned out, we had last minute cancellations from our Sikh and Muslim representatives, making it a dialogue of four religions. 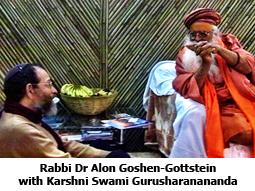 Shrivatsa spoke from a Hindu perspective; I spoke from a Jewish perspective. Fr. 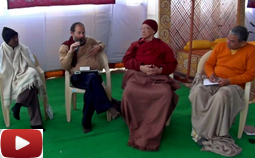 Robin Seelan S.J, who teaches theology in Chennai and is a graduate of Elijah’s training program in Amritsar provided a Christian perspective, and Lama Duboom Tulku, former director of Tibet House and close aide to HH the Dalai Lama, was the Buddhist voice. The plan was simple – every day we would explore another aspect of what it means to share between religions, following a trajectory of programs that have taken place at Elijah, or that we seek to presently cultivate. Accordingly day 1 was devoted to “Sharing Friendship”, the theme of our 2012 meeting in Oxford; Day 2 to “Sharing Wisdom”, theme of our 2007 meeting in Amritsar. Day 3 was devoted to “Sharing Prayer”, a focus that Elijah is increasingly moving toward, as readers who have followed the Hope statement and Hope project will realize. Day 4 was devoted to “Sharing Repentance”. 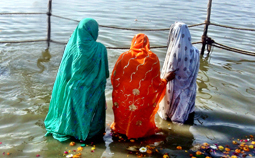 As the context is one of repentance and purification, we wanted to know how each of our traditions understands repentance, how prayer leads to repentance and how rituals of purification, such as the rituals practiced at the Kumbh Mela might resonate across traditions. The videos of the sessions will be edited and posted to our YouTube channel. The Sharing Wisdom section offers a taste of these conversations. This edition’s Sharing Wisdom section consists of a video of discussions on day 3, on the theme of “Sharing Prayer”. Each tradition suggests what it is that is essential or typical about prayer in the given tradition. The ensemble of the discussion amounts to a brief and inspiring introduction to prayer in four religious traditions. We have prepared a brief trailer, consisting of about 2-3 minutes on prayer from each of our speakers (click on picture to see trailer). We hope you find this conversation as exciting and rewarding as we did.